You see something at your organization that is just not right. Maybe it is a problem that everyone is ignoring, but the big bosses could be upset if you say something. Or maybe it is an ethical issue that you think needs to be seriously addressed. But what would be the reaction if you say something? We all know stories of whistleblowers or change agents who Speak Up – and then things don’t go so well for them. But what about the ones that are successful? What do they have in common? *Laying the Groundwork. Build a reputation for being excellent in your job. Further, develop a reputation for being someone who is honest and can be trusted. A reputation with these two attributes sets you up to be listened to when you are ready to Speak Up. *Choosing Your Battles. If you Speak Up about every little thing then – in time – people may think of you as a chronic complainer. Ask yourself how important the issue really is. Also, people who are “competently courageous” have excellent timing. Make sure that the situation it right for Speaking Up. *Persuading in the Moment. Be prepared to make your case! Frame the issue in a context that is appealing – such as the best long term interest of the organization. Use data to support your assertions. And keep cool – manage your emotions. If others react emotionally, then stick to your facts and don’t escalate emotionally. *Following Up. Your Speak Up moment is only the beginning. Pay attention to relationships and follow-up with people to make sure they understand your intent. Build momentum and alliances with others you think will support your case. 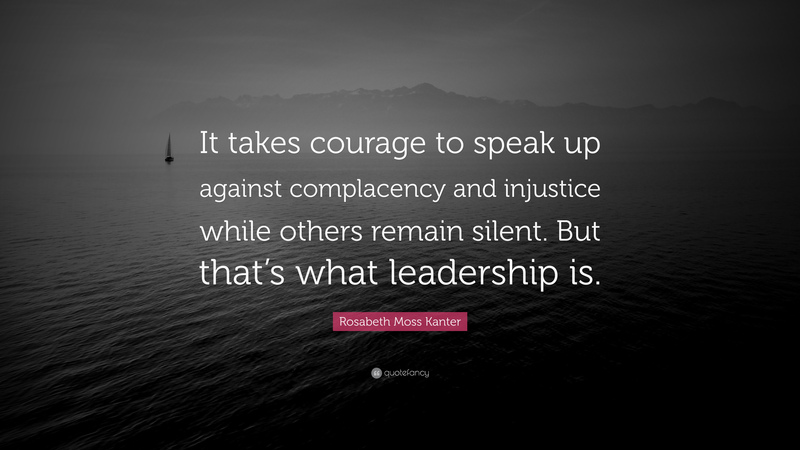 The Courage to Speak Up does not comes without risks – that is why it takes courage. But following these guidelines can help you stay true to your values and make the risks you take worth the challenge. *“Cultivating Everyday Courage,” Detert, J. R. Harvard Business Review, November-December, 2018, pp. 128-135.